Scanner manufacturers offer many promotions and rebate specials that give you extra savings on certain models. This page shows you all the scanner models with active rebates or special pricing. AV122 18ppm Color Duplex 8.5x14"
Reclaim precious desktop territory with the Avision AV100 series, our most compact high speed document scanner with ADF built in. Perfect for users with limited desktop space, or a front desk environment. Scan in color, grayscale, or monochrome at speeds starting from 18 pages per minute up to 25 pages per minute in simplex mode and 50 images per minute in duplex mode. Every AV100 series model is equipped with CCD sensors for high quality scans, and a 50 sheet capacity ADF for efficient batch scans. All of the benefits of a small footprint device without sacrificing speed or quality! KV-S1015C 20ppm Color Duplex 8.5x100"
The Panasonic KV-S1015C scanner is the quick and easy way to transform your paper documents to high-quality digital files, allowing you to manage, send or upload them to the cloud with just the touch of a button. Compact design and intuitive operation make the KV-S1015C a perfect fit for small to medium size businesses, offering users straightforward set-up, innovative functionality and a host of advanced features, like a cutting-edge paper feed mechanism equipped with Ultrasonic Double-Feed Detection and an Active Double-Feed Prevention Roller System that ensures reliable document feeding at an impressive scan speed of up to 20 pages per minute. 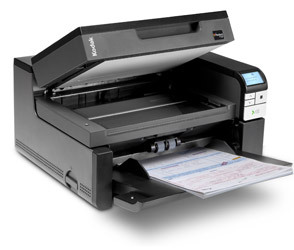 KV-S1026C 30ppm Color Duplex 8.5x100"
The Panasonic KV-S1026C scanner instantly transforms your paper documents to high-quality digital files, allowing you to simplify your records management, and making it easy to route documents to the destination of your choice with the touch of a button. Compact design and intuitive operation make the KV-S1026C a perfect fit for small to medium size businesses, offering users straightforward set-up, innovative functionality and a host of advanced features. Like a cutting-edge paper feed mechanism equipped with Ultrasonic Double-Feed Detection and an Active Double-Feed Prevention Roller System that ensures reliable document feeding at an impressive scan speed of up to 30 pages per minute. i2900 60ppm Color Duplex 8.5x160"
The Kodak i2900 Scanner is a robust rotary A4 desktop scanner with an ingenious book-edge flatbed scanner built right in. 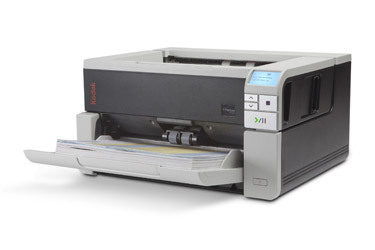 It features a 250-sheet feeder/elevator and consistently high throughput speed, even when imaging double-sided and color documents at up to 300 dpi. Add in Intelligent Document Protection, as well as Kodak's Perfect Page technology and Smart Touch functionality, and you've got a fiercely powerful scanner in a remarkably compact package. Smaller footprint, bigger impact. A robust design that takes up less space but can still take on heavy-duty scanning challenges. ScanMate i940 20ppm Color Duplex 8.5x65"
The only thing worse than data trapped on paper is information trapped in your computer. 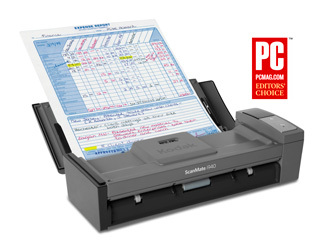 With the compact KODAK SCANMATE i940 Scanner, collecting, managing, and distributing information is simple and desktop-friendly. Kodak’s Smart Touch functionality replaces complicated multi-step scanning processes with one-touch simplicity. So, you get compact with a huge impact. Create email attachments, picture files, and searchable PDFs – and get your documents to the cloud, so they can be accessed wherever you are. i3200 50ppm Color Duplex 12x160"
Delivering efficiency, information, and results with every scan. The Kodak i3000 Series Scanners are purpose-built to deliver consistent throughput and minimize downtime for your office. They're loaded with impressive imaging functionality for onboarding of information, and Intelligent Document Protection to defend against damaged documents and lost data. These A3 rotary scanners can take on virtually any challenge while taking up less space on your desk — making them the perfect fit for any business that doesn't have a second to waste. i3400 70ppm Color Duplex 12x160"